The EzHarness|Style, safety, and comfort has never been so EZ! EZHarness™ is a “step-in” harness, quick and easy to apply, while comfortable and safe for your dog. 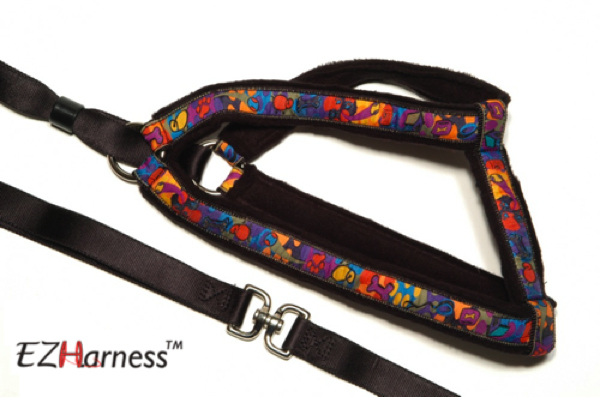 The EZHarness™ features double-padded fleece in every component that touches the pet's body, preventing chaffing or injury, and includes an elegant satin-finish nylon webbing, integrated with a 4' lead, a swivel mechanism mitigating tangling, and a fleece padded handle for the owner's comfort. The product is offered in three colors (black, red, and royal blue), and five sizes. To apply, simply adjust the product to maximum width, slide the harness around pet's head and neck, have pet step-through with it's two front paws, and slide the loop adjuster until firm.